"Too many notes, my dear Mozart, and too beautiful for our ears". Listening to this CD certainly brought to mind the Emperor's (probably apocryphal) comment. There are indeed many notes here, and the first thing to say is that they are negotiated with immense capability and aplomb by Murray McLachlan. But too many? Thinking in particular of Erik Chisholm's immense sonata, it would be very easy to say that this or that passage is inessential to the musical argument. But to say that would be assuming that a 'musical argument' is a standard process, whereas we know that the great composers of piano sonatas - Beethoven, Schubert, Liszt, Chopin, Scriabin, Prokofiev, etc - all had their different ways with the form and would have dealt entirely differently with the same material. And Chisholm is different again. The first movement with its pibroch theme - "The Sinclair's March" - is highly discursive, yet I was always listening keenly for what would happen next, while enjoying the moment. Hearing the music for the first time was a real voyage of discovery. The powerfully motoric Scherzo second movement is full of pianistic invention while the Lament, written to commemorate the loss of the submarine HMS Thetis in 1939, interweaves brooding chords with intricate bagpipe-like scales. An Allegro Moderato completes the work in powerful style. Chisholm merits the soubriquet 'MacBartok' but certainly not to his detriment. Yes, the sonata is long, perhaps overlong but I didn't regret at all those few extra minutes, and certainly not in McLachlan's magnificent performance which feels absolutely true to the spirit of the work. Bartók's bagpipes and drums preface the Chisholm sonata naturally and the remaining composers on the CD are all associated in some way. Chisholm alone constituted the audience at the first performance of Sorabji's three-and-a-half hour leviathan Opus Clavicembalisticum but I found that even the three minutes of the Fantasiettina on this CD outstayed their welcome. Others may make more sense of this composer who seems to get good and bad press in equal measure. This Fantasiettina is in three sections with an opening whose likeness to that of Prokofiev's Toccata only served to remind me how much more memorable the Russian's music is. I could not escape the feeling that the abruptness of the coda was simply the composer getting bored with the 'ravishing textures' (as the liner notes have it) of the slow section. For just the right number of notes, my personal favourite on this CD has to be Stevenson's Sonatina based on themes from Weill's music to Der Dreigroschenoper. Not a note is wasted as Stevenson artfully combines 'Pirate Jenny', the 'Instead of' song and the Tango-Ballad, with 'Mack the Knife', as in the opera, casting a shadow over all. Stevenson miraculously encapsulates of the mood of the opera while offering pianistic challenges in the form of a miniature study and a fugue on top of some delicious counterpoint. Murray McLachlan's performance is a model of clarity. Begun in 1987, the Sonatina was modified as recently as 2003; it would be fascinating to know what the latest changes were! Stevenson is a giant of British music, indeed of all music, all too few of whose several hundred works have been recorded. Raymond Clarke's performance of the huge and remarkably inventive Passacaglia on DSCH on Marco Polo is eminently recommendable. Murray McLachlan has himself recorded the extraordinarily individual Piano Concertos and various other piano works for Olympia. The remainder of the CD is devoted to one of Busoni's most ambitious homages to Bach and the art of counterpoint. Once again, McLachlan plays this work with the utmost clarity and power though I found the music curiously uninteresting and difficult to listen to, unlike that of Stevenson, a pupil of Busoni. Perhaps the work will yield more on repeated hearing which McLachlan's clearly committed playing will make all the easier. I am sure I will return to this CD again and again, to experience great pianism, unique sonorities, to try harder with Busoni and to get closer to the essence of music with Stevenson's Sonatina. 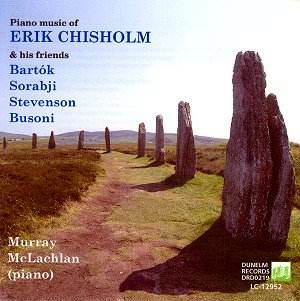 ERIK CHISHOLM Piano Music Murray McLachlan Piano. Olympia OCD 639 £10 P&P free See review to purchase.